The nutrition program detailed here is amazing, it's fun, and it works. But it isn't for everyone. It's made for people doing serious weight training, typically an hour using weights that are around 70% or more of your max. I do believe you could expend enough effort in an incredibly intense 15 minute session to allow yourself the ice cream and pizza. But if you're just starting out, and exercising with yoga or long walks, backloading is unfortunately not for you. The biggest perk of my job as a fitness magazine editor has to be getting the opportunity to meet some of my longtime heroes. I interviewed Hulk Hogan in his own back yard while he tore off a succession of T-shirts for our photo shoot, and I’ve listened to Dolph Lundgren tell me about the time he got chased by a group of African Americans who believed he’d really killed Apollo Creed in Rocky IV. The most satisfying of all my encounters with fit celebrities, of course, was with Arnold, whom I spoke to for the cover story of the September issue of Men’s Fitness, on stands this week. It wasn’t only a thrill because I had the opportunity to ask him a lifetime of questions—and get them “answered immediately”—but because, much to my surprise, he ended up asking me some. The Governator had apparently learned about Carb Back-loading (CBL) from his staffer, Daniel, a big workout buff who had read about it on my website and in Men’s Fitness magazine, where I am the training director. I’m not surprised that it stuck with him or that it piqued Arnold’s interest—CBL is probably the most effective diet strategy to stay lean while adding muscle mass that anyone who’s tried it has come across. And it’s definitely the most fun. Carb Back-loading is the brainchild of John Kiefer, a nutrition consultant to athletes including bodybuilders, powerlifters, and figure competitors. As the name suggests, it entails saving the bulk of your carbohydrate intake for the end of the day. The big selling point for CBL is all the so-called junk food you can get away with on it. We’re talking pizza, ice cream, and french fries, and not only will they not make you fat or unhealthy, they’ll make you big, strong, and lean. First, let’s look at the way carbs affect your body. When you eat them, they’re broken down into glucose. This causes blood sugar levels to rise, and the hormone insulin is released to bring them back down. To get rid of the excess carbs, insulin transports them—as well as protein and fat, if you’re consuming them simultaneously—into either muscle or fat cells. If you’ve recently trained with weights, the delivery will be made to your muscles to support recovery and growth. If you’ve been lying on the couch all day watching Arnold movies (and frankly, I wouldn’t blame you), insulin will store the carbs as fat. Until the spike in blood sugar comes down, insulin won’t allow your body to use fat as fuel. It would much rather you get rid of the extra sugar first. On the flip side, by avoiding carbs most of the time, your blood sugar levels remain low. There won’t be any significant insulin release, and your body will be free to burn fat as its main fuel source, helping you stay lean. The best time to eat carbs, then, is right after a strenuous workout (especially strength training), when your muscles’ carb stores are depleted and blood sugar is low. But this notion is nothing new. 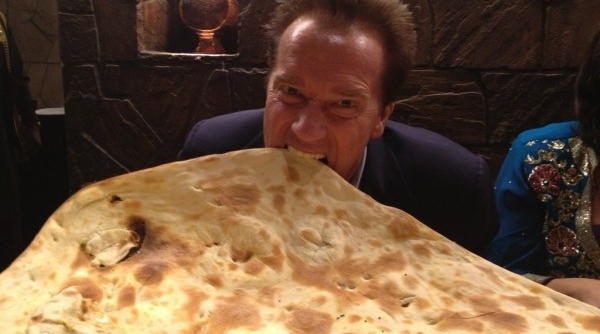 Arnold and other bodybuilders understood the advantages to a low-carb diet and occasional carb-ups years ago. The timing, however, is what makes back-loading more than just another diet, and a true Godsend to anyone who wants to indulge in their favorite foods without looking like they do. When you first wake up every morning, your body is primed to burn fat. The worst thing you could do at this time is to have a classic American breakfast, including foods like juice, toast, or cereal. Cortisol, a stress hormone, rises during the night while you sleep and peaks at about 7 a.m. Left alone, it helps you burn fat, but when you feed yourself an abundance of carbs, cortisol will encourage fat storage just as insulin can. By waiting until cortisol levels fall naturally later in the day, and then strength training before ingesting carbs, you maximize carbs’ ability to benefit your physique while minimizing their potential to damage it. But what about eating carbs before a workout? This is often the prescription that nutritionists give, based on the assumption that carbs provide quick energy needed for exercise. However, remember what we said about insulin release and fat burning. Eating carbs pre-workout reduces the amount of fat you can burn during the session, and honestly, you don’t need them. The truth is, your body can run just fine on protein and fat during even the most gut-busting training session (provided you eat enough of these nutrients, which we’ll discuss below). Another consideration is the effect carbs have on your nervous system. Without them, your sympathetic nervous system—your body’s “fight or flight” response to stress—is on overdrive. You think clearly and react quickly, and can even recruit muscle fibers more efficiently. Eating carbs dampens this response. You know how you feel sluggish and can’t concentrate after a big meal? You don’t want to be in that condition before you lift weights, and it only takes a small serving of carbs to impair your performance. After training, you can eat carbs with impunity, which brings us to the “fun” part. This is the general approach, as directed by CBL’s creator, John Kiefer (visit him at dangerouslyhardcore.com). 1. For 10 days, cap your carb intake at 30 grams per day. This is as strict as you’ll have to be, so tough it out—it will train your body to store carbs more effectively when you eat them later. While 30 is your limit, that’s just a buffer zone. Aim for as few as possible. Any kind of carbohydrate apart from fiber counts. Green vegetables are fine, but root vegetables (such as potatoes), grains, and fruit must be all but eliminated. Beyond the limited carbs, there are no other dietary restrictions, other than no alcohol. (You’ll be eating pizza soon enough, so don’t complain). Eat one gram of protein per pound of your body weight daily (so if you weigh 180 pounds, eat 180 grams), and consume plenty of fat. Red meat, whole eggs, avocadoes, cheese, and bacon are all good choices. And don’t fear saturated fat. In 2010, the Annals of Internal Medicine affirmed earlier findings that a low-carb diet with saturated fats actually improved risk factors for heart disease. A University of Connecticut study from 2007 found that low-carb dieters who consumed more than three times the saturated fats as subjects in a low-fat group did saw greater improvement in LDL cholesterol levels. In order to preserve muscle mass, provide the energy for training, and to keep you from feeling hungry, fat must be eaten along with protein. You don’t have to count calories. Expect to feel tired and foggy the first few days. This is a normal response to a sudden removal of carbs from the diet, and it will take a little time before your body switches over to burning fat and restores your energy levels. (Read Arnold’s post about The Spark if you need to bolster your resolve.) Coffee with heavy cream or sugar-free energy drinks are allowed. Continue to train as normal. 2. On the evening of the 10th day, eat a ton of carbs. Plan this day in advance so you can train in the afternoon or early evening. Afterward, splurge. Eat plenty of carbs and protein (ancillary fat is alright too). Your body is so depleted by this point that it can’t store carbs for fat, so don’t worry about being gluttonous. Aim for around one gram of carbs for each pound of body weight, but you may be able to handle much more. Just eat well and reward yourself. These carbs must be the high-glycemic, insulin-driving kind. This is no time to have a conservative portion of brown rice or oats. Nothing replenishes the muscle cells like starchy and sugary foods, so white rice, white potatoes, and very ripe bananas are ideal. You can also enjoy pastries, ice cream, and other “bad” foods. A night of back-loading might include a cheeseburger with french fries, a milkshake, and an apple crisp followed a few hours later by a protein shake, milk, and cookies. 3. Repeat back-loading on days you train. On days you don’t, eat low-carb as you did for the first 10 days. Back-loading works best when exercise takes place between roughly 4 p.m. and 6 p.m., but it can be adjusted for morning training if needed. In this case, have coffee but no food before training, and then have only a small meal or shake containing 30–50 grams of protein and the same amount of carbs. Eat low-carb from then until the evening, when you can back-load, but do it more conservatively. Since your workout was earlier, your muscles aren’t as sensitive to insulin, so you’ll have to eat fewer carbs than if you had just trained, lest you risk gaining fat. This same rule applies to women. CBL is not exclusively beneficial to men, but because males carry more muscle mass, they can handle more carbs. Ladies can even skip a post-workout meal/shake and opt to get their carbs in the form of dessert. Apart from counting protein and ballparking your carbs, you don’t need to log anything. Just pay attention to how you look the morning after back-loads. If soft and bloated, dial down the carbs a bit next time. Lean and ripped, you’re right on track. If your goal is to gain maximum muscle mass while keeping your body fat in check, simply consume more protein and carbs after training and during your back-loads (you can also experiment with off-day back-loads). Those seeking to optimize fat loss just need to eat less. Though I didn’t explain the back-loading concept to Arnold quite as eloquently as I did above (at least my trembling hand didn’t drop the phone), he immediately identified with it. In fact, Arnold inadvertently stumbled onto the concept along with Franco Columbu back in the 70s. Arnold went on that other bodybuilders scoffed, saying it would ruin he and Franco’s diet, smoothing them out before the contest. But nine Mr. Olympia victories between them proved there was something to CBL some 40 years before it was officially created. Actually, Arnold, I didn’t explain it. You just did. To learn more about the brain (and brawn) behind Carb Backloading, visit John Kiefer at http://www.dangerouslyhardcore.com. Check out how Sean's abs looked after a night of cereal, sushi rice, and candy at his website. Sean Hyson is the Group Training Director for Muscle&Fitness and Men’s Fitness magazines. Read his review of the Carb Back-loading e-book on seanhyson.com.